If you read that when its written down, you might have to take a second glance and read it slowly. We are small business owners, therefore by default, we are a jack of all trades. We do absolutely everything. And, generally, when the customer comes to us, they ask “Can you do something that is slightly out of our specialty?” We generally say, Yes. I remember many years ago, when we stocked a business with all its fire safety equipment and we took care of all their fire safety signs as well. We found the company that usually does it. They are a great company and do a fantastic job. We had the sign made and prepared to put it up. However, when it went up there were problems. We had to rent scaffolding, which the customer had to pay for (an expense we had not anticipated), and other things that we did not know about. It all worked out all right, but it took a lot of effort for me because I didn’t know exactly what I was doing. What I should have said is, “No, I’m sorry — we don’t make those kinds of signs.” Even better, I should have said no and recommended the sign company from the beginning that knew what they were doing. You need to tell people what you don’t do. People will trust you more by being honest. You can’t do everything, so say so. In your marketing material, write a whole page or sheet about who you are, but also tell them who you aren’t as well. . If you tell them you who aren’t, you pre-empt a lot of this. You are getting in to your potential customers. Remember, I said do not use the scatter-gun approach. #2 of the 5 P’s of Marketing is this — to only market to potential customers — customers within your avatar. By explaining who you are not, you will exclude people who are not going to want to buy from you. I hope that make sense. It really does work. Marcus Sheridan at TheSalesLion.com does a great job in teaching us how to do this. He will tell you over and over to just keep answering questions from customers about what you do and don’t do. He is in a swimming pool business and he installs in ground fibreglass pools. Now, the most popular type of pool in the USA is the concrete pool, so he gets asked all the time of he does those types of pools. People ask him — “What’s the difference between concrete and fibreglass? He will give them the explanation, assess where they want their pool, and if a concrete pool is better for them, he’ll tell them and he’ll say, “I’m sorry, we’re not the best fit for you because we don’t do concrete pools. He doesn’t think, “Oh, better do those as well. He just narrows and focuses on his niche. He focuses on his niche, but he makes it very clear what he doesn’t do. So, I want you to think about that. It will work by the way, This stuff is not just made up and I did not just pluck it out of the air. This is stuff that works. 1. 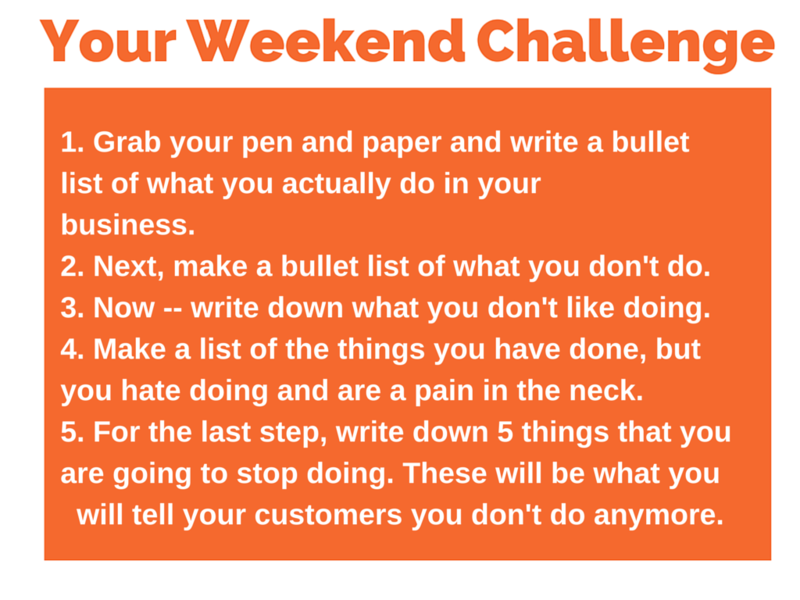 Grab your pen and paper and write a bullet list of what you actually do in your business. What we do? I want a list of bullets. So if you are a baker, What do you bake? Who do you bake for? So for instance, if you cater for birthday parties, fine. Write that. 2. Next, make a bullet list of what you don’t do. So if you don’t cater for birthday parties, write that down. So, when someone phones up, and says, “you’re not gonna say um when it is? Ah, let me look at the diary samples”. You’ll gonna say no, but I recommend_____, and you can recommend a competitor. How better to build trust? 3. Now — write down what you don’t like doing. 4. Make a list of the things that you have done, but you hate doing and are a pain in the neck for you. 5. 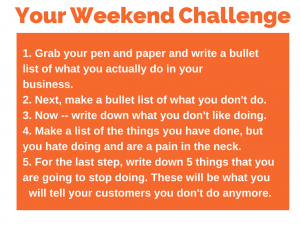 For the last step, write down 5 things that you are going to STOP doing. 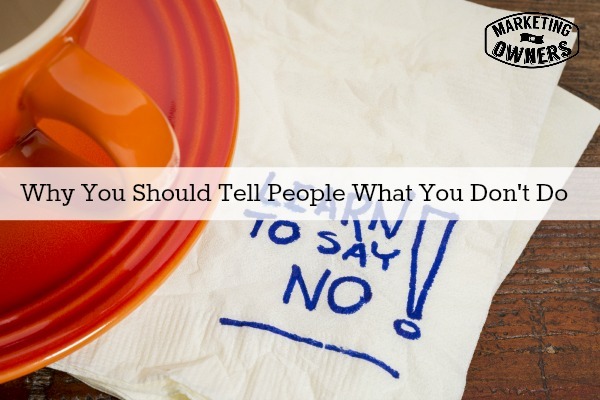 These will be what you will tell your customers you don’t do anymore. This is simple stuff people. This will help you to concentrate on your niche. This improves your profits. Improves your time. It makes your life better. And that’s what its all about. Have a fabulous weekend wherever you are. I will see you next week.